Postpartum depression may be associated with new moms, but did you know dads can get it, too? It’s estimated that one in ten fathers experience postpartum depression, yet it’s extremely rare for them to talk about it. Here, we’ll look at what male postpartum depression is, its symptoms and the help available if you, or your partner, are experiencing it. What Is Male Postpartum Depression? Male postpartum depression is basically the same type of depression experienced by new moms. It can present itself in several ways and most often it appears to affect younger men in their 20’s, though it can develop at any age. It’s also referred to as paternal depression or postnatal depression. While it can develop for no logical reason at all, a lot of the time it is brought on by a partner’s own battle with postpartum depression, or due to the stress of having a new baby. Many people overlook the additional stress a new baby places on the father. Concern and attention from friends and relatives is typically directed to the mom, while the dad gets left out. However, many new fathers are responsible for providing for the family financially which in itself can be tough, along with the mood swings and decline in the relationship which often happens when baby comes along. There’s also the lack of sleep, which can contribute towards depression and irritability. A lot of men suffering with postpartum depression go undiagnosed due to the stigma attached to talking about male mental health. It can also be pretty tough to determine the issue given the fact that having a new baby can naturally bring additional stress and anxiety. So, how can you determine whether the negative feelings you or your partner are facing are normal or actually down to postpartum depression? As you can see, some symptoms are a lot scarier than others. 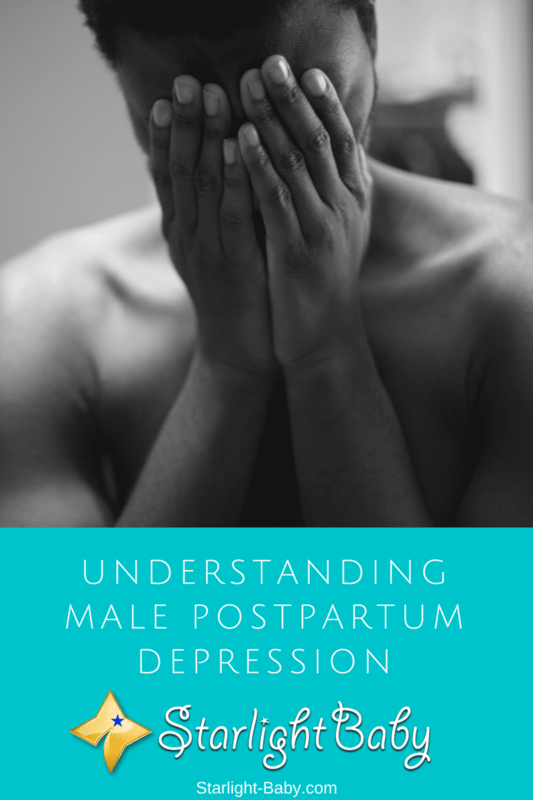 Each man will experience postpartum depression differently and it can vary a lot in severity. Thoughts of suicide, harming the baby and obsessive fears about baby’s health are relatively rare, but they are obviously extremely worrying. If you or your partner have felt this way, it’s important to seek medical help as soon as possible. Medications can be described to help banish these thoughts and fight the depression. There are many more symptoms not listed above, so the advice to dads would be if you don’t feel like yourself, go and get checked out by a doctor. Postpartum depression is nothing to be ashamed of. Even if you’re having scary thoughts, you’re not going to be judged when you seek help and it’s more common than you might think. You just need to remember it’s not you, it’s the depression talking. Are Some Men More At Risk Than Others? Currently, medical experts are only just starting to understand male postpartum depression. However, there are certain risk factors which have been identified which may contribute to your chances of developing the condition. Most risk factors appear to be related to personal circumstances. Problems sleeping, a strained relationship with either your spouse, parents or parents-in-law, and a lack of support can all contribute towards depression. If there’s financial issues this can also play a major part in postpartum depression. It’s not just personal circumstances which pose a bigger risk however. Men who have a history of depression are also more at risk than others. It can also be linked to a change in hormones. Perhaps the most compelling risk however, is if your partner has postpartum depression. Experts have found that up to 50% of men who have a spouse dealing with postpartum depression, also develop the condition. Often, it isn’t just one of these risk factors which leads to male postpartum depression, it’s more likely a combination of factors. Can Male Postpartum Depression Be Prevented? As male postpartum depression is often related to personal circumstances, there are sometimes steps you can take to reduce your chances of developing the condition. Perhaps the most beneficial preventative measure is to ensure you have plenty of support around you. Chatting with your partner before baby is born and coming up with a parenting plan is a great way to ensure you both feel supported after the birth. Communication is key so making sure you talk to your partner about how you’re feeling will also help, rather than trying to bottle it up. Obviously, some personal circumstances are hard to change such as finances. So, it could help to find out exactly what financial help you’re entitled to and come up with a financial plan you can stick to once baby arrives. It’s also important to note that the earlier you detect postpartum depression, the easier it will be to treat. So, the first time you suspect something is wrong, reach out to your doctor and let them know how you’re feeling. How Is Male Postpartum Depression Treated? If it turns out you or your partner does have postpartum depression, the first step is to talk to your doctor. They can help put you in touch with the right support, or if the problem is severe, prescribe medication which could help. It’s important to avoid turning to unhealthy coping mechanisms such as drinking as this will only make the depression worse. Exercise is one of the best coping strategies you can use so if you do start to feel low or stressed, head out for a run, hit the gym or get out on a push bike. You may also find it useful to try and meet other dads. Being able to share your experiences or just let off steam with other men in the same situation can be a huge help. Just like moms need support from other moms, dads need it, too. If the depression is linked to you feeling guilty for not bonding with baby, try to make the extra effort to spend time with them. Changing diapers, giving them a bottle or just cuddling baby will help you to develop a strong bond. The main thing you need to remember is that bonding with baby doesn’t just happen overnight. It’s natural for many fathers to feel left out and not as close to their baby as they imagined they would be. Simply spending more time with them and remembering that you are important in their lives too can really help. Overall, male postpartum depression is very real and it can have a devastating impact on new dads. The key is to ensure you seek help as soon as possible when you suspect something is wrong. It’s nothing to be ashamed of and is a lot more common than many men realize. Have you or your partner been affected by postpartum depression? Share your story below! This one good informative post. To say I’ve learned a few thing on this post is an understatement. I haven’t suffered from male postpartum or any related condition. This is in fact the first time am hearing about it. As I read the symptoms and came upon “having the thoughts of harming yourself or the baby” and “suicidal thoughts” I stopped, for a minute there I got scared, maybe having a baby isn’t a good idea. But then, their only symptoms and as you pointed out, it can be treated. Though experts are just beginning to uncover male postpartum as stated in the post, I fear a lot of men already suffer from it and will be difficult to handle as majority might not be willing to come forward. Come to think of it, it is highly likely that a lot of men also suffer or suffered from it but were not willing to talk about it. If a father is equally involved in child-rearing, it is highly likely he also becomes overwhelmed by it all at times, and he too suffered from depression. Depression is real and it happens to both men and women, so I’m sure it’s the same thing with postpartum depression. IT is not always easy to welcome a new baby to the world, and things get tougher for couples not ready for the new baby. I never knew that that is called postpartum depression, but I always look some nursing mothers and see they’re passing through some depression. It is good to realize that this condition can also affect and that will create that awareness in men to plan ways to ease the pressure of welcoming a new baby. True, Henrywrites. Being prepared would greatly help ease the difficulty of raising a child. Child-rearing is a huge challenge, but the challenges can be overcome by equipping oneself with the right information or how-to’s. Awareness is important because parents (especially new parents) will go through a lot of stressful situations before becoming experts. Being aware of what to expect when the baby arrives is one key element of how to over depression and stress that will come with the new baby especially as it concerns the man. This is the reason I’ve enjoyed every bit of my time reading and learning news ways to controls situations like that. I am a nurse and even back when I was still in the university, this subject was not given much attention compared to female postpartum depression. I guess maybe because as you said, there’s only 1 out of 10 fathers who would actually experience this kind of problem. Then again, this is very important for everyone to know, especially the new or soon to be parents. Dads usually are just on the sideline when pregnancy or child birth is the subject. People tend to forget that they too experience certain kinds of fears and anxieties and since males don’t usually speak out about how they feel, which is opposite of their counterpart, it becomes harder to notice. It is very important for us to see that this kind of problems do exist, and may eventually help out others who might experience this in the future. I completely agree that this problem should be recognized and we should start the dialogue with our partners since, like you said, men don’t usually speak out about their feelings. Some might feel different but not even understand what it is and probably shut down. It’s sad to think about all the men who have experienced this silently, all while trying to be supportive to their wives and help out with their newborn child. We should discuss the possibility of this happening before the baby comes, as the article mentions, so that dad’s can be prepared and make the transition of becoming a father easier. Postpartum depression for men are true. Sometimes they are too worried of the finances that leads them to depression. This commonly happens for unexpected pregnancies that bothers them. Having a child is rewarding but from the onset of pregnancy is really adjustment of everything. Well planned pregnancy is way lot better. Once you are totally ready it gives you security of all things needed, financially, emotionally. Healthy mom is healthy baby. Yes, worries about finances to support the family could really become a source of depression, especially for those who are not earning enough. Being prepared financially, emotionally, psychologically and physically is very important. For others, however, this is a bitter lesson they have to contend with if they got married young or when financially unstable. A baby requires a lot of expenses so if one doesn’t have enough money to spend, it could spell trouble and may be the cause of arguments between couples. I totally agree with you, SirenOnFire and Jordana. The fact that there is 1 out of 10 fathers who experience this is alarming. That means there are 100,000 fathers out of one million who are silently suffering or suffered from this type of depression, and it is likely that they never got the support they need, or only got very little because the emphasis was on the mothers. That’s a pity. More women should be made aware that this is happening so that they will be able to monitor or determine if their partners are suffering from postpartum depression. This is a great post. A couple of my male friends experienced this and they are often forgotten, especially fathers who’ve experience infant loss. Having an infant is a lot of work and I cant imagine how stressful it can be, especially after a parent is back at work. A lot of these jobs only allow 1 month leave too. Parents are treated unfairly in the workforce. Male Postpartum depression? I had never heard of this term. Thankfully, when my baby was born, I did not experience any of such things. I did know about female Postpartum depression, and thankfully my wife did not experiencer this. Okay, now this is a nice write up I never knew of this till now, though I personally express depression alot in my life. I worry about finance too how I should feed and fend for myself, does it mean that I have postpartum disorder too? Or just normal depression? Why I asked this is because you said women only experience it when they become mom and they get to have it, but am trying to relate it to how ladies and men feel when they are broke and lack financial security, I have feel down like these when I can’t afford a little thing for myself, should I call it male postpartum depression too?